Jasbir migrated to California from India in 1977, and spent more than a decade as a migrant agricultural worker before establishing his own 1.5 acre farm. In 1994, he spent his life savings on a 20-acre kiwi vineyard — an operation which has since grown to more than 300 acres and includes fruit packing, cold storage and marketing facilities. California has nearly 300 kiwifruit growers who farm around 13 acres each. Most of these farms are concentrated in the Central Valley. California produces around 98 percent of the kiwifruit grown in the United States. California’s kiwifruit growers are an asset to the state’s economy; they spend nearly $18.1 million annually in the state. Kiwifruit are one of nature’s perfect foods: fat free, low in calories, high in energy and an excellent source of antioxidants. Due to California kiwifruit’s fall harvest, fresh kiwifruit is available during the winter months, an uncommon time for the “homegrown” California fresh fruits. Cut kiwi in half and scoop out fruit. Puree in a small food processor or blender. (You should have about 2 cups.) Place in a medium saucepan and cook over medium-low heat for 15 to 20 minutes, stirring frequently. Remove from heat when mixture has reduced to 1 cup; let cool. Stir together sugar and cream cheese in a medium bowl. Slowly whisk in half and half, then stir in vanilla and kiwi. Chill well, then transfer to the bowl of an ice cream maker and freeze according to manufacturer’s instructions. Cover and freeze until ready to serve. 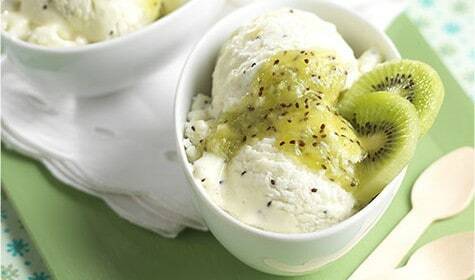 To make cheesecake sundaes, drizzle with additional pureed kiwi and top with crumbled graham cracker crust.